Compensatory mechanisms are often used to achieve stability by reducing variance, which can be accomplished via negative feedback during homeostatic regulation. In principle, compensation can also be implemented through feedforward mechanisms where a regulator acts to offset the anticipated output variation; however, few such neural mechanisms have been demonstrated. We provide evidence that an Aplysia neuropeptide, identified using an enhanced representational difference analysis procedure, implements feedforward compensation within the feeding network. We named the novel peptide “allatotropin-related peptide” (ATRP) because of its similarity to insect allatotropin. Mass spectrometry confirmed the peptide's identity, and in situ hybridization and immunostaining mapped its distribution in the Aplysia CNS. ATRP is present in the higher-order cerebral-buccal interneuron (CBI) CBI-4, but not in CBI-2. Previous work showed that CBI-4-elicited motor programs have a shorter protraction duration than those elicited by CBI-2. Here we show that ATRP shortens protraction duration of CBI-2-elicited ingestive programs, suggesting a contribution of ATRP to the parametric differences between CBI-4-evoked and CBI-2-evoked programs. Importantly, because Aplysia muscle contractions are a graded function of motoneuronal activity, one consequence of the shortening of protraction is that it can weaken protraction movements. However, this potential weakening is offset by feedforward compensatory actions exerted by ATRP. Centrally, ATRP increases the activity of protraction motoneurons. Moreover, ATRP is present in peripheral varicosities of protraction motoneurons and enhances peripheral motoneuron-elicited protraction muscle contractions. Therefore, feedforward compensatory mechanisms mediated by ATRP make it possible to generate a faster movement with an amplitude that is not greatly reduced, thereby producing stability. Compensatory mechanisms serve to ensure stable outputs in biological systems. In the nervous system, these mechanisms are prevalently observed in the homeostatic regulation of neuronal and network functions, where compensation is mostly accomplished through negative feedback (Davis, 2006; Marder and Goaillard, 2006; Turrigiano, 2008) (Fig. 1A). In principle, compensation can also be implemented through feedforward mechanisms where a regulator acts to offset the anticipated output variation without delay (Fig. 1B1). Although feedforward compensation is well known in industrial applications of control theory and is proposed to participate in limb, gaze, and postural control and multisensory integration (Shadmehr and Mussa-Ivaldi, 1994; Hay and Redon, 1999; Mehta and Schaal, 2002; Russo et al., 2005; Combes et al., 2008), to our knowledge few such neural mechanisms have been directly demonstrated. Specifically, while feedforward inhibition has been implicated as a mechanism that may tune the firing pattern of individual neurons (Mittmann et al., 2004, 2005; Gabernet et al., 2005), less is known about which mechanisms are implemented in feedforward compensation of motor output/behavior. Here we provide evidence that the central and peripheral actions of a single neuropeptide may act in a feedforward compensatory manner to regulate output of a motor network. Feedback versus feedforward compensation. A, Negative feedback compensation is accomplished by using a sensor that monitors the controlled variable. The output of the sensor is compared with a setpoint, and the difference between the setpoint and the sensor output is used by the controller to compensate changes in the controlled variable. B1, A form of feedforward compensation. The feedforward controller acts directly to compensate the anticipated variation in the “controlled variable” resulting from variation of the “other variable” in the absence of a sensor or a setpoint. B2, Feedforward compensation by ATRP in Aplysia. Centrally (orange), ATRP, which originates from a higher-order interneuron (CBI-4), shortens protraction duration but also increases firing frequency of protraction motoneurons (B31/32 and B61/62), thereby implementing feedforward compensation. In the periphery (yellow), in addition to contraction–amplitude increase resulting from frequency increase of motoneurons (1), these motoneurons also release ATRP and myomodulin (MM) (2). The combined actions of ATRP and MM also contribute to the feedforward compensation by directly enhancing muscle contraction amplitude. An emerging principle of peptidergic actions is that many neuropeptides are present both peripherally and centrally while having diverse actions in both sites. In vertebrates, the most obvious examples are several classes of the so-called gut–brain peptides (Strand, 1999; Chaudhri et al., 2008), including somatostatin, tachykinins, cholecystokinin (CCK), VIP, and pancreatic polypeptide family peptides. Similarly, in invertebrates including Aplysia, several neuropeptides are found to be present both centrally and peripherally (Miller et al., 1991; Furukawa et al., 2001, 2003; Proekt et al., 2005; Jing et al., 2007; Audsley and Weaver, 2009; Vilim et al., 2010; Wu et al., 2010) that also have diverse modulatory actions in both locations. Although many actions of these peptides have been identified, it is largely unknown how these peripheral and central peptide actions are functionally linked. We show that concerted central and peripheral actions of a novel peptide, allatotropin-related peptide (ATRP), in Aplysia feeding motor system contribute to a form of feedforward control. We identified ATRP by adapting the representational difference analysis (RDA) procedure (Lisitsyn et al., 1993; Hubank and Schatz, 1994) to single identified neurons. We targeted the relatively small radula protraction motoneuron B31/32 (Hurwitz et al., 1994), which acts peripherally but is also part of the feeding central pattern generator (CPG) that provides a potential substrate for feedforward control. Moreover, we localized ATRP to a higher-order interneuron, cerebral-buccal interneuron (CBI) 4 (CBI-4), which does not contain other known peptides. Previous work (Jing et al., 2004) showed that CBI-4 promotes short protraction duration. We now show that ATRP has a similar effect. Because shorter protraction duration may reduce protraction amplitude, we tested a hypothesis that other network actions of ATRP may act in a compensatory manner to enhance protraction amplitude. This would allow the feeding network to generate a shorter movement with an amplitude that is not unduly reduced, thereby constituting a more stable output. Aplysia californica were obtained from Marinus Scientific and maintained in circulating artificial seawater (ASW) at 14–15°C. Animals were anesthetized by injection of 333 mm isotonic MgCl2 (50% of body weight) and specific ganglia were dissected out and maintained in ASW containing the following (in mm): 460 NaCl, 10 KCl, 55 MgCl2, 11 CaCl2, and 10 HEPES buffer, pH 7.6, in a dish lined with Sylgard (Dow Corning). We adapted the RDA to identify novel peptides from single identified neurons in the Aplysia CNS. The entire procedure can be divided into three steps (Fig. 2): (1) Isolation of two types of identified cells. The first is the cell of interest or “tester” whose peptides are to be identified; the second cell, or “driver,” is used to subtract sequences that are shared with the tester. The rationale behind this RDA approach is that the tester shall contain one or more peptides that are not present in the driver. (2) Amplification of cDNA from the RNA of the tester and the driver. (3) RDA with the amplified cDNA of the tester and the driver. These steps are detailed in the three sections below. Previously we have used ethanol, which stabilizes the RNA, to enable isolation of individual neurons for subsequent amplification of cDNA (Vilim et al., 2001). However, ethanol treatment is incompatible with the Fast Green injections used to visualize the identified neurons for subsequent collection; the Fast Green dye diffused from the cells far too quickly to be useful. In contrast, for biochemical analysis of single neurons, propylene glycol has been successfully used to stabilize the neuronal somata during collection in conjunction with Fast Green dye marking of identified neurons (Vilim et al., 1994). Here, we found that this alternative collection technique also maintained the integrity of the RNA during collection. 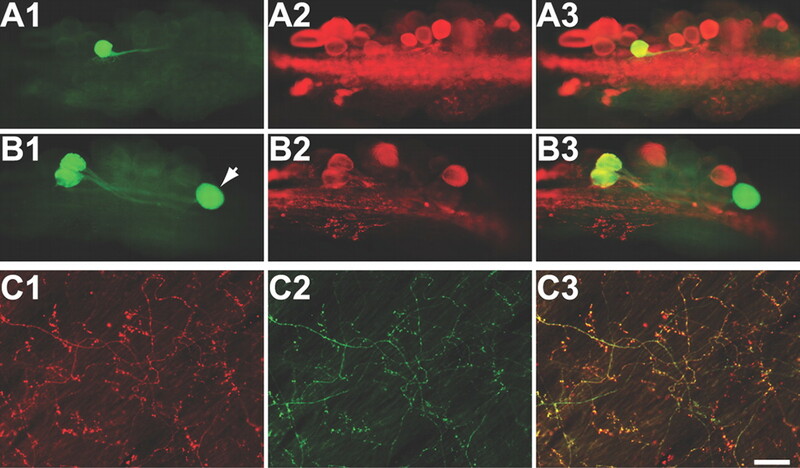 For the cell isolation procedure in this study, the neurons of interest were electrophysiologically identified and iontophoretically injected with Fast Green dye. The dish containing ganglia was cooled on ice for 15 min and the ASW was replaced with a solution of ice-cold 50% propylene glycol, 1.2 m NaCl in DEPC-treated H2O and incubated on ice for 10 min. The dye-marked neurons were collected with sharp forceps and transferred to 0.65 ml microtubes via visual control. Here, B31/32 protraction motoneurons were used as tester cells and modulatory neuron metacerebral cells (MCCs) (Jing et al., 2008) as driver cells. Multiple B31/32 neurons were collected into the same tube and stored at −80°C to maintain the integrity of the RNA before its isolation. Similarly, the MCC neurons were collected into separate tubes. Multiple neurons of the same type were pooled to compensate for potential animal-to-animal variability in RNA expression. Amplification of cDNA from identified neurons was performed as a modification of our previously published procedure (Vilim et al., 2001). First, RNA was isolated from the collected neurons with 200 μl of TRIzol (Invitrogen) and 10 μg of glycogen as a coprecipitant according to the earlier method (Schacher et al., 1999). The RNA was resuspended in 20 μl of RNase-free H2O and 2–5 μl (one neuron's worth of RNA) was used in a 25 μl first-strand cDNA synthesis reaction. Reverse transcription (RT) was performed with Superscript II (Invitrogen) according to the manufacturer's instructions, with the exception that the final concentration of MgCl2 in the reaction was elevated to 6 mm. PCR amplification of the synthesized cDNA required addition of primer sequences to both the 5′ and 3′ ends of the first-strand cDNA. Addition of a primer sequence to the 5′ end of the first-strand cDNA was accomplished by using a tagged oligo(dT) primer (GCTGGAATTCTTTTTTTTTTTTTTTTTTTT) to initiate the cDNA synthesis at the poly(A) tail. Addition of a primer sequence to the 3′ end of the cDNA was accomplished using a template switch oligo (ATCACTGTTTGAATTCGCGGG) (see SMART handbook; Clontech). Following first-strand cDNA synthesis, the reaction was heated to 70°C for 20 min to inactivate the reverse transcriptase and the RNA was digested by incubation at 37°C for 30 min with 5 U of RNase H (Epicenter Technologies). One microliter of the RT reaction was amplified in a 25 μl PCR using the Advantage polymerase mix (Clontech) and the same primers described above. Four such reactions were combined for each cell to minimize for potential amplification of related differences in the representation of amplified transcripts. Stage 1: amplification of the driver DNA with specific adaptors. The amplified cDNA from the last section was digested with DpnII and adaptors were ligated to the cut ends. The driver (MCC) cDNA was ligated to R-Bam adaptors, while the tester (B31/32) cDNA was ligated to N-Bam adaptors (for adaptor sequences, see Lisitsyn et al., 1993). The driver DNA was amplified with biotinylated R-Bam primer (MWG Biotech) (Sive and St John, 1988). Stage 2: denaturation and subtractive hybridization. A 20-fold to 50-fold excess of the amplified driver was mixed with the unamplified tester (which contained N-Bam adaptor), denatured by heating at 95°C for 10 min, and hybridized overnight at 65°C. cDNA common to both the tester and the driver would form cross-hybrids, but cDNA unique to the tester would not be able to form cross-hybrids with the driver. After the hybridization, we modified the RDA procedure (Lisitsyn et al., 1993; Hubank and Schatz, 1994) to include a physical subtraction to enrich the tester DNA bound to the tester DNA. Specifically, streptavidin was added and bound to the biotin present on the driver DNA. Phenol/chloroform extraction was then used to remove the streptavidin and bound DNA from the aqueous phase (Sive and St John, 1988). This procedure would reduce the driver DNA bound to either the driver DNA or the tester DNA because the driver DNA contained 5′ biotin. Conversely, this procedure allowed us to omit the preamplification and digestion of PCR products by mung bean nuclease that were performed in the earlier protocol (Hubank and Schatz, 1994). Stage 3: PCR amplification to further enrich “Tester” cDNA bound to Tester cDNA. Before the final amplification, we performed primer extension at 72°C on the aqueous phase. Next, the aqueous phase was amplified with the tester N-Bam primer, which exponentially amplified Tester cDNA bound to Tester cDNA. In contrast, this tester N-Bam primer was unable to amplify the driver DNA and produced only linear amplification of remaining tester/driver cross hybrids. Using this improved RDA technique, a single round of hybridization was sufficient to produce unique products. These products were cut with DpnII, subcloned into BamHI cut vector, and sequenced. In our experiments, one of the clones that we sequenced contained the full coding sequence of ATRP. Northern blot analysis was performed as described previously (Fujisawa et al., 1999; Furukawa et al., 2001; Proekt et al., 2005). Briefly, RNA was isolated from homogenized pooled ganglia using the acid–phenol method (Chomczynski and Sacchi, 1987). RNA from each ganglion type (buccal, cerebral, pleural, pedal, and abdominal) was fractionated separately using denaturing agarose gels (1.5%) and transferred to nylon membranes (Biodyne B; Invitrogen). The RNA was immobilized with Stratalinker UV (Stratagene) and visualized by staining with 0.02% methylene blue in 0.3 m Na-acetate, pH 5.5. After washing out the excess stain with DEPC-treated water, the blot was scanned to document the amount of RNA transferred from each lane. After destaining with 1% SDS, 1 mm EDTA, and 50 mm Na3PO4, pH 7.2, the blot was prehybridized for 1 h at 50°C using 50% formamide, 10% dextran sulfate, 7% SDS, 10 mm EDTA, 50 μg/ml salmon sperm DNA, and 250 mm Na3PO4, pH 7.2. Heat-denatured, random-primed (New England Biolabs), [32P]dCTP-labeled cDNA probe (for ATRP) was added, and hybridization was continued overnight at 50°C. Blots were washed twice for 15 min at room temperature with 2× standard saline phosphate EDTA (SSPE) and 0.1% SDS, washed for 60 min at 50°C with 0.1 × SSPE and 0.1% SDS, and exposed to film. Autoradiographs and methylene blue-stained blots were scanned into Photoshop (Adobe Systems) and compiled into figures. In situ hybridization was performed as described previously (Vilim et al., 2001). Ganglia were digested with 1% protease type IX (Sigma-Aldrich) in 10 ml of ASW for 3 h at room temperature (with rocking) to facilitate the removal of the sheath. After digestion, the ganglia were washed with ASW and fixed overnight at 4°C with 4% paraformaldehyde (Electron Microscopy Sciences) in PBS. The ganglia were then washed, desheathed, and dehydrated in an ascending ethanol series. After rehydration in a descending ethanol series, the ganglia were prehybridized for 6 h and then hybridized overnight at 50°C in hybridization buffer (50% formamide, 5 mm EDTA, 5 × SSC, 1 × Denhardt's solution, 0.1% Tween 20, and 0.5 mg/ml yeast tRNA) containing 2 μg/ml digoxigenin-labeled cRNA probes made from ATRP cDNA templates. After washout of the probes, the ganglia were then incubated overnight at 4°C with a 1:200 dilution of alkaline phosphatase-conjugated anti-digoxigenin antibody (Roche Molecular Biochemicals) in PBS containing 0.1% Tween 20 (PBT), 0.2% bovine serum albumin (BSA) (catalog #A0281; Sigma-Aldrich), and 1% normal goat serum (NGS). After washes with PBT to remove unbound antibody, the ganglia were washed with detection buffer (100 mm NaCl, 50 mm MgCl2, 0.1% Tween 20, 1 mm levamisol, and 100 mm Tris-HCl, pH 9.5) and developed with 4.5 μl of nitroblue tetrazolium and 3.5 μl of 5-bromo-4-chloro-3-indolyl phosphate (Roche Molecular Biochemicals) in 1 ml of detection buffer. The staining reaction was monitored visually and stopped by washing with PBT when the level of staining was adequate. The stained ganglia were observed and photographed using a fluorescence microscope (Nikon) with epi-illumination against a white background. Photographs were taken with a Nikon CoolPix 990 digital camera, imported into Photoshop, and compiled into figures. Antibodies were generated to the entire sequence of ATRP. The peptide antigens were prepared as described previously (Fujisawa et al., 1999; Furukawa et al., 2001; Li et al., 2001; Sweedler et al., 2002). Briefly, the antigen was prepared by coupling synthetic peptide (SynPep) to BSA using 1-ethyl-3-(dimethylaminopropyl)carbodiimide (EDC) (catalog #E7750; Sigma-Aldrich). The coupling was performed in 1 ml of 50 mm NaH2PO4, pH 7.2, containing 10 mg of BSA, 1 mg of peptide, and 25 mg of EDC. The mixture was allowed to react overnight at 4°C, and the coupled antigen was purified from the reaction using a Microcon-30 (Millipore) spinning at 13,800 × g for 30 min at 4°C. The retentate was washed four times with 0.4 ml of 50 mm NaH2PO4, pH 7.2, then resuspended in 0.5 ml of the same buffer and transferred to a new tube. For each antigen, two male Sprague Dawley rats (250–300 g; Taconic Farms) were immunized by intraperitoneal injection with either 12.5 μl (∼250 μg; rat 1) or 25 μl (∼500 μg; rat 2) of antigen in an emulsion of 0.3 ml of PBS and 0.3 ml of Freund's complete adjuvant. At days 21 and 42, the rats were boosted by intraperitoneal injection with either 6.25 μl (∼125 μg; rat 1) or 12.5 μl (∼250 μg; rat 2) of antigen in an emulsion of 0.3 ml of PBS and 0.3 ml of Freund's incomplete adjuvant. The animals were killed by decapitation at 49 d, and the blood was harvested and processed for serum. Sera were aliquoted, frozen, and lyophilized or stored at 4°C with EDTA (25 mm final concentration) and thimerosal (0.1% final concentration) added as stabilizers. For antibodies that produced immunostaining, specificity was confirmed by preincubation of the primary antibody with the corresponding synthetic peptide (100 μm), which abolished the staining (data not shown). Immunocytochemistry was performed as described previously (Furukawa et al., 2001; Jing et al., 2007). Tissues (ganglia and muscles) were fixed in 4% paraformaldehyde, 0.2% picric acid, 25% sucrose, and 0.1 m NaH2PO4, pH 7.6, for either 3 h at room temperature or overnight at 4°C. After washes with PBS ganglia were desheathed to expose the neurons, except in ganglia from small animals (10–15 g). All subsequent incubations were done at room temperature. Tissue was permeabilized and blocked by overnight incubation in blocking buffer (10% normal donkey serum, 2% Triton X-100, 1% BSA, 154 mm NaCl, 50 mm EDTA, 0.01% thimerosal, and 10 mm Na2HPO4, pH 7.4). The primary antibody was diluted 1:250 in blocking buffer and incubated with the tissue for 4–7 d. The tissue was then washed twice per day for 2–3 d with washing buffer (2% Triton X-100, 1% BSA, 154 mm NaCl, 50 mm EDTA, 0.01% thimerosal, and 10 mm Na2HPO4, pH 7.4). The tissue was then incubated with a 1:500 dilution of secondary antibody (lissamine rhodamine donkey anti-rat Jackson ImmunoResearch Laboratories) for 2–3 d. The tissue was then washed twice with washing buffer for 1 d and four times with storage buffer (1% BSA, 154 mm NaCl, 50 mm EDTA, 0.01% thimerosal, and 10 mm Na2HPO4, pH 7.4) for 1 d.
For double-labeling of two peptides (i.e., ATRP and myomodulin) in the same tissue, the primary antibody to ATRP was a rat antibody generated as described in the last section, while the primary antibody to myomodulin was a rabbit antibody we generated previously (Miller et al., 1991; Vilim et al., 2000). Two different secondary antibodies (against either rat or rabbit), conjugated to either Rhodamine Red-X or fluorescein (Jackson ImmunoResearch Laboratories), were used to visualize the different primary antibodies. For double-labeling of physiologically identified cells with ATRP, neurons were identified based on morphology and electrophysiological characters and injected with carboxyfluorescein (Jing et al., 2003), and the tissue was fixed and processed for immunocytochemistry as described above. All chemicals were obtained from Sigma-Aldrich unless otherwise stated. The peptide standards for mass spectrometry (MS) calibration were supplied by Bruker Daltonics. To confirm synthesis of ATRP in the Aplysia CNS, we used matrix-assisted laser desorption/ionization (MALDI) time-of flight (TOF) MS on neurons from cerebral “B” clusters (see Fig. 4D,E). The cerebral ganglion was treated with 1% protease IX in ASW with antibiotics for 30 min at 34°C and then desheathed. B cluster neurons were manually isolated individually or in small groups using electrolytically sharpened tungsten needles. Isolated neurons were transferred onto a MALDI sample plate using homemade plastic micropipettes. Excess ASW was aspirated from the sample plate, deposited cells were washed quickly with dH2O to remove salts, and 0.4 μl of concentrated MALDI matrix (2,5-dihydroxybenzoic acid, 50 mg/ml, 50% acetone) was applied onto the sample spots. Positive ion spectra were manually acquired in reflectron mode with external calibration using a Bruker Ultraflex II MALDI-TOF mass spectrometer (Bruker Daltonics). For structure elucidation, peptide extract was prepared from one cerebral ganglion by homogenizing it in 300 μl of acidified acetone (40:6:1 acetone:water:HCl). Extract was centrifuged at 14,000 rpm for 15 min and supernatant was collected. Supernatant was dried in a SpeedVac concentrator (Thermo Scientific) to evaporate acetone and reconstituted in 20 μl of 0.1% formic acid. Reconstituted extract was fractionated via HPLC on a Magic 2002 HPLC system (Michrom BioResources) using a C18 microbore column (1 × 150 mm) with eluting gradient of acetonitrile with 0.1% formic acid and 0.01% trifluoroacetic acid. Fractions were manually collected and evaluated for ATRP content by MALDI-TOF MS; a fraction containing a peak at m/z 1533.76 was subjected to a second-stage reverse phase separation using the Micromass HPLC system coupled via an electrospray ionization source to an HCT Ultra ion trap mass spectrometer equipped with an electron transfer dissociation module (Bruker Daltonics). An optimized methanol/formic acid elution gradient was used in this case. Tandem MS precursor ion selection was limited to three ions per minute sorted by signal intensity, with the preferred charge state set to +2 and the active dynamic exclusion of previously fragmented precursor ions limited to three spectra per min. The scan m/z ranges for MS and MS/MS were 350–1200 and 50–2200, respectively. For peptide identification, peak lists from fragmentation spectra were interpreted with PEAKS Studio software (Bioinformatics Solutions), and resulting ion series were manually verified. The fragment ion nomenclature is as from the Biotools software, including ions labeled as z and z+1 ions, although these are z+1 and z+2 ions according to Biemann nomenclature. Radioimmunoassays (RIAs) were performed as described previously (Vilim et al., 1996a,b, 2000). The RIA antibodies were generated in rabbit against ATRP (made by Harlan Bioproducts for Science) and myomodulin (Vilim et al., 2000) coupled to BSA. Diluted antiserum was added to the RIA buffer (154 mm NaCl, 10 mm Na2HPO4, 50 mm EDTA, 0.25 mm thimerosal, and 1% BSA, pH 7.5) at a concentration of 200 ng/ml and was able to bind 20% of the counts after a 3 d incubation. The trace used in the RIA was made from ATRP (with F/L→Y substitution to reduce interference of antibody binding caused by iondination of the native Y at the C terminus; GYRYNSASRVAHGYamide, made by PeptidoGenic Research) and myomodulin-A (MMa) iodinated with 125I, and monoiodinated peptide was purified with HPLC. HPLC fractions containing the monoiodinated peptide were pooled, lyophilized, and resuspended in RIA buffer such that 100 μl contained 10,000 cpm in the gamma counter. Electrophysiological recordings from CNS preparations (including the cerebral and buccal ganglia) were performed as described previously (Jing and Weiss, 2005). To prevent movements of ganglia caused by myoactive ATRP during bath application, we treated the ganglia with 0.8% protease IX for 1–2 min. Subsequently, the ganglia were desheathed, transferred to a recording chamber containing ∼1.5 ml of ASW, continuously perfused at 0.3 ml/min, and maintained at 14–17°C. To suppress polysynaptic pathways, a high divalent cation saline was used containing the following (in mm): 368 NaCl, 10 KCl, 13.8 CaCl2, 101 MgCl2, and 10 HEPES, pH 7.6). Peptides were dissolved in ASW immediately before each application, and the ASW with the peptide was perfused into the recording chamber. The neuromuscular experimental procedure was modified from a previously described procedure (Hurwitz et al., 2000). The preparations, maintained at room temperature (18–22°C), consisted of the buccal ganglion, I2 nerve, and I2 muscle. The buccal ganglion was desheathed to expose B61/62. The I2 muscle was pinned along the edge that was originally attached to the I1/I3 muscle (the edge of the I2 muscle that was originally attached to the esophagus was left free). A subchamber made from a 5 cc plastic syringe (∼8 mm in height, with a volume of ∼1 ml) was gently placed around the I2 muscle on top of the I2 nerve and sealed with petroleum jelly (Vaseline). A force transducer (Isotonic Transducer “60–3000,” Harvard Apparatus) was used to monitor muscle contractions and was attached to the free end of the I2 muscle. A counterweight was applied but was adjusted to be small (∼45 mg) to prevent excessive stretching of the muscle. Both the outside compartment (with the buccal ganglion) and the muscle subchamber contained ASW. Peptides were selectively applied into the subchamber as single bolus and mixed with the ASW inside the subchamber. Thus, the buccal ganglion did not have to be treated with protease to prevent movement of the ganglion. I2 muscle contractions can be elicited when any of its four motor neurons (B61, B62, B31, and B32) are stimulated (Hurwitz et al., 1994). In most experiments, however, we stimulated B61 (∼18 Hz, 1–2 s) because B61 has been shown to elicit I2 muscle movement that is best measured in this arrangement (Hurwitz et al., 2000). Electrophysiological recordings were digitized online with Axoscope (Molecular Devices) and plotted with CorelDraw (Corel). Graphs were plotted using Axum (Mathsoft). Data are expressed as mean ± SEM. Statistical tests were performed using Prism (GraphPad Software). They included Student's t test and repeated-measures one-way ANOVA, as appropriate. When data showed significant effects in ANOVA, further individual comparisons were performed with Bonferroni's correction. To identify novel peptides in selected identified neurons, we adopted the RDA procedure (Lisitsyn et al., 1993; Hubank and Schatz, 1994) and improved it by including a physical subtraction procedure (see Materials and Methods). We sought to identify peptides contained in a motoneuron (MN), such as B31/32, and used it as a tester. We used the MCC (Jing et al., 2008, 2009), which does not contain known peptides, as a driver to subtract sequences that are shared with the MN (Fig. 2). 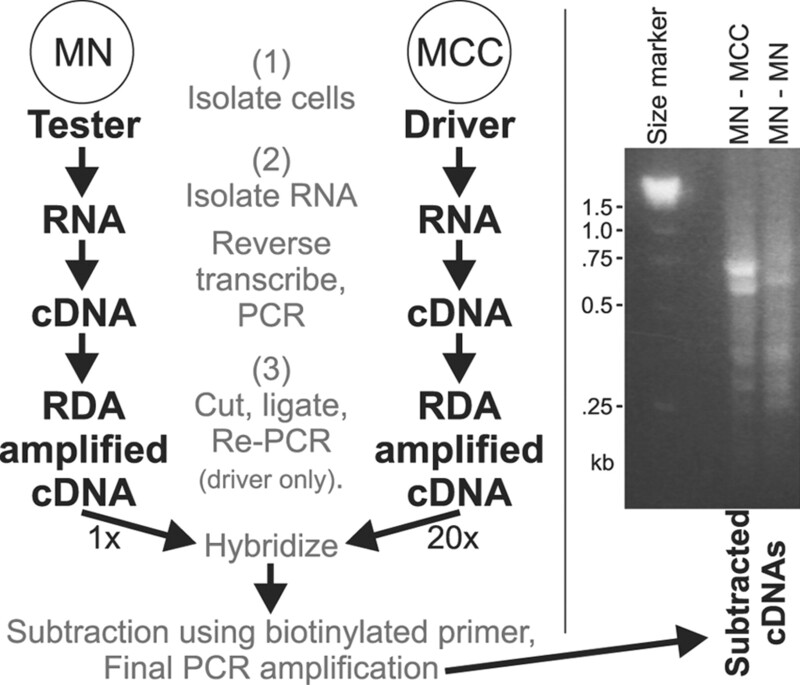 Subtraction between MN and MCC allowed abundant RNAs that are present in MN to show up as prominent difference bands, i.e., between 0.5 and 0.75 kb (Fig. 2, right). In control experiments, subtraction between the same neurons (e.g., between two distinct MNs) did not show these bands. The data suggest that the difference bands between the MN and MCC may contain RNAs that are specifically expressed in the MN but not in the MCC. Representational difference analysis for single neurons. Left, Diagram of the RDA procedure performed with a MN as the tester, and the MCC as the driver. Right, Northern blot gel of the subtracted cDNA. Subtraction between MN and MCC showed prominent difference bands between 0.5 and 0.75 kb. In contrast, subtraction between MN and MN did not show such bands, indicating the difference bands between MN and MCC are specific. To identify specific cDNA bands that code prohormones/neuropeptides, we cloned the difference bands and verified the true difference clones by differential screening. The difference clones were then sequenced. We isolated 23 clones from the RDA subtraction between B31/32 and MCC. Sequencing revealed eight clones that have an open reading frame, which could be used for BLAST (basic local alignment search tool) analysis. Of these eight clones, two clones have a signal peptide. One of the two clones does not contain any obvious peptides. The other clone (685 bp) produced a consensus containing an entire open reading frame of a putative neuropeptide precursor (GenBank accession number HQ634151) (Fig. 3A). The peptide was named allatotropin-related peptide or ATRP because of shared sequence homology with insect allatotropin (Fig. 3B) (Elekonich and Horodyski, 2003; Weaver and Audsley, 2009). Thus, ATRP was the only one having a clear coding sequence that encoded a peptide. ATRP has also been identified in several other animals, including the mollusk Lymnaea (Fig. 3C) (Elekonich and Horodyski, 2003). ATRP precursor sequence and a comparison of ATRPs from related species. A, The consensus cDNA sequence and open reading frame of the ATRP precursor. Amino acids are numbered on the right and the predicted amidated peptide (ATRP sequence) is underlined. Potential dibasic processing sites are shown in bold, and the vertical bar (|) denotes the predicted signal sequence cleavage site. Asterisk (*) indicates stop codon. B, Comparison of known precursors for allatotropin in two insects, armyworm and Manduca, and ATRP in Aplysia. Similarity or “consistency” (http://www.ibi.vu.nl/programs/pralinewww/) between the three precursors is colored coded as indicated at lower right. ATRP sequences are between the arrows. Note that the numbering in Aplysia ATRP is shifted forward by 3 after 21 and by 5 after 83 compared to the numbering in A. C, Comparison between peptide sequences in several species. Allatotropin, originally identified in insects, has also been identified in annelids (earthworm) and mollusks (Lymnaea). The peptides typically have an N-terminal G F K/R and a C-terminal A/S R/H G F/Y amide. Additional homology exists (data not shown) between the Aplysia and insect precursors. The Lymnaea peptide differs from the Aplysia peptide by a single amino acid. The Lymnaea peptide, named motility modulating peptide, was identified on the basis of its ability to potentiate contractions of the esophagus. The Lymnaea precursor has not been described. Identification of ATRP precursor sequence allowed us to use Northern blots to determine the distributions of ATRP mRNA in specific ganglia of Aplysia. Figure 4A shows that ATRP mRNA (∼1.5 kb) is present in all major ganglia—abdominal, buccal, cerebral, pleural, and pedal—with the buccal and cerebral ganglia showing the most abundant expression of ATRP mRNA. Northern blot gel of ATRP mRNA in the CNS of Aplysia (A) and distribution of ATRP positive neurons and fibers in the buccal and cerebral ganglia (whole mounts) (B–E). A, Hybridization of total RNA isolated from the different Aplysia ganglia with an ATRP cDNA probe. Top, Northern analysis shows that ATRP mRNA is unevenly distributed throughout the central ganglia of Aplysia and is ∼1.5 kb in length (note that the subtracted cDNA in Fig. 2 had a shorter length because those cDNA contained a partial sequence of ATRP mRNA as a result of DpnII digestion). The highest levels of ATRP mRNA appear to be present in the buccal and cerebral ganglia. Bottom, Ribosomal RNA (rRNA) stained with methylene blue was used as control to show similar rRNA expression in different ganglia. A, Abdominal ganglion; B, buccal ganglion; C, cerebral ganglion; E, pedal ganglion; L, pleural ganglion. B, C, Buccal ganglion. Note the immunoreactive axons in the CBC. D, E, Cerebral ganglion. Note the staining of B cluster neurons and also the presence of an intensely stained neuron in the E cluster on the ventral surface. In contrast, the MCC (arrowheads) was not stained. 1, In situ hybridization; 2, immunocytochemistry; 3, composite drawings of ATRP neurons. Scale bars (in C2 and E2), 500 μm. Buccal abbreviations: CBC, Cerebrobuccal connective; N1, nerve 1; N2, nerve 2; N3, nerve 3; SN, salivary nerve; EN, esophageal nerve; RN, radula nerve. Cerebral abbreviations: UL, Upper labial nerve; PT, posterior tentacular nerve; ON, optic nerve; AT, anterior tentacular nerve; LL, lower labial nerve; CBC, cerebrobuccal connective; CPe, cerebropedal connective; CPl, cerebropleural connective. To map specific ATRP-containing neurons throughout the CNS, we performed a combined approach: in situ hybridization against ATRP precursor mRNA and immunohistochemistry with a rat antibody raised against ATRP. We found that ATRP-expressing neurons are distributed in all central ganglia, i.e., the buccal ganglion (Fig. 4B,C), the cerebral ganglion (Fig. 4D,E), the pleural-pedal ganglia (Fig. 5A-D), and the abdominal ganglion (Fig. 5E,F), with some of them localized to distinct clusters. We also observed several ATRP-positive neurons on the caudal surface of the buccal ganglion (Fig. 4C1-3), including the locations where B31/32 are located. Double-labeling experiments (see Fig. 7A) indicated that B31/32 cells were indeed positive for ATRP, verifying that our RDA method can identify novel peptides in single neurons. Furthermore, consistent with the specificity of the RDA, the MCC in the cerebral ganglion, used as the driver for subtraction, did not show staining (Fig. 4D, arrowheads). Distribution of ATRP-positive neurons and fibers in the pleural and pedal ganglia (A–D) and the abdominal ganglion (E, F) (whole mounts). 1, In situ hybridization; 2, immunocytochemistry; 3, composite drawings of ATRP neurons. Scale bars (in B2, F2), 500 μm. Pleural-pedal abbreviations: Rt, Right; L, pleural ganglion; E, pedal ganglion; LE, pleuropedal connective; EE, pedal commissure; EC, cerebropedal connective; LC, cerebropleural connective; LA, pleuroabdominal connective; E5, posterior tegumentary nerve (P5); E6, anterior parapodial nerve (P6); E9, posterior pedal nerve (P9). Abdominal abbreviations: LC, Left pleuroabdominal connective; RC, right pleuroabdominal connective; VN, vulvar nerve; BN, branchial nerve; STN, spermathecal nerve; PN, pericardial nerve; GN, genital nerve; SN, siphon nerve. For simplicity, not all nerves in the pleural and pedal ganglia were drawn. In situ hybridization and immunohistochemistry revealed a similar distribution of ATRP-positive somata, corroborating that these probes (see Materials and Methods) are specific. Both in situ hybridization and immunostaining can detect positive somata, but immunostaining also allows detection of ATRP-positive fibers in nerves and connectives. Notably, we observed immunopositive fibers in the cerebral-buccal connective (CBC) (Fig. 4B), which links the buccal ganglion with the cerebral ganglion. We performed MS experiments to elucidate the processing of the ATRP prohormone and the structure of the final peptide products. Because B cluster neurons of the cerebral ganglion (Teyke et al., 1989) stained for ATRP using both in situ hybridization and immunostaining (Fig. 4E, B), this large cluster of neurons has been used as a source of ATRP products for our MS characterization efforts. A peak at m/z 1533.76, matching the calculated mass of ATRP protonated ion with an accuracy of 13 ppm, was clearly observed in analyzed cell samples (Fig. 6A, n = 7). Additional peaks were also observed, consistent with a positive staining of B cluster neurons with FMRFamide (FMRFa)-specific (Jezzini et al., 2005) or enterin-specific (Furukawa et al., 2001) probes. To confirm the structure of the m/z 1533.76 peak, we performed MS/MS peptide sequencing on fractionated extracts from one cerebral ganglion. Fragmentation of the 1533.76 putative peptide that was observed as a doubly charged ion at m/z 767.90 verified the sequence GFRLNSASRVAHGY-NH2 corresponding to ATRP (Fig. 6B). Together, ATRP, identified using RDA and MS, is broadly distributed and present in the Aplysia CNS, providing a basis for subsequent functional studies of ATRP. 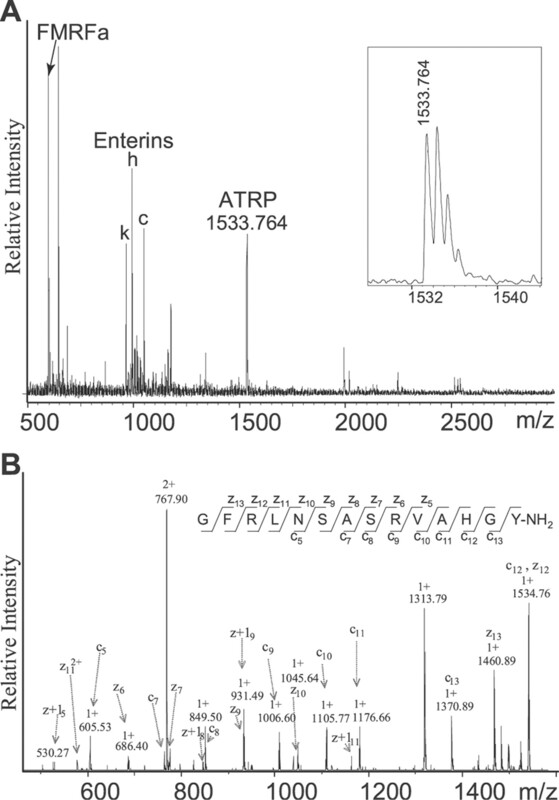 Mass spectrometry analysis confirming the ATRP sequence. A, Representative MALDI-TOF MS spectrum from a small group of cells of a cerebral B cluster shows the presence of ATRP, enterin and FMRFa peptides. k, h, c, Alphabetical designation of the three forms of enterins (see Furukawa et al., 2001, their Table 2). B, Electron transfer dissociation fragmentation spectrum of doubly charged ion at m/z 767.90 reveals complete complementary c ion and z ion series that confirm the ATRP structure. Next we sought to identify the physiological actions of ATRP-containing neurons in the cerebral and buccal ganglia in which feeding-related neurons are located. The buccal ganglion contains elements of the buccal CPG, which includes feeding interneurons and motoneurons that innervate the buccal musculature controlling feeding movements. The cerebral ganglion contains higher-order interneurons (CBIs) that are activated when food contacts the mouth area. Acting through their axonal projections to the buccal ganglion, these CBIs activate and/or modulate the feeding CPG and thus produce various motor outputs. Importantly, many of the CBIs and motoneurons contain modulatory neuropeptides (Cropper et al., 1987a; Weiss et al., 1993; Hurwitz et al., 1999; Xin et al., 1999; Jing and Weiss, 2001; Morgan et al., 2002; Sweedler et al., 2002). We first explored whether ATRP contributes to physiological functions of ATRP-containing neurons in the buccal ganglion. Because ATRP was identified based on RDA of protraction motoneurons B31/32, we expected ATRP to be present in B31/32. Moreover, examination of ATRP immunostaining suggested that two other protraction motoneurons, B61/62 (Hurwitz et al., 1994), may also contain ATRP. We performed double-labeling experiments to determine whether both B31/32 and B61/62 were in fact ATRP immunoreactive. We identified B31/32 and B61/62 based on morphological and physiological criteria, injected them with carboxyfluorescein, and then performed immunocytochemistry (n = 4). Both B31/32 (Fig. 7A) and B61/62 (Fig. 7B) were double-labeled with ATRP and carboxyfluorescein, indicating that these neurons are ATRP immunopositive. Protraction motoneurons B31/32 and B61/62 and their fibers are immunopositive for ATRP. The right panels are overlaid images of the left and middle panels, where the yellowish color indicates double-labeling. A, B, Carboxyfluorescein-injected B31/32 (A1) and B61/B62 (B1, two adjacent neurons) immunostaining with antibody to ATRP (A2, B2). Control B4/5 neuron injected with carboxyfluorescein (B1, arrow) does not immunostain with ATRP. The commissures of both buccal ganglia of A and B face right, but the caudal side is up in A, and the rostral side is up in B. C, Processes and varicosities in the I2-radula protractor muscle that immunostain with an antibody to ATRP (C1) mostly overlap (C3) with those that immunostain with an antibody to MM (C2). Scale bar (in C3), 200 μm. Protraction motoneurons B31/32 and B61/62 provide the sole innervation of the I2 protractor muscles (Hurwitz et al., 1994). Thus, it was likely that neural processes within the I2 muscles would be ATRP immunopositive. Indeed, ATRP immunostaining of I2 muscles revealed an extensive network of staining of fine fibers and varicosities (nerve terminals) in the I2 muscles (Fig. 7C1) that presumably originate from B61/62 and B31/32. Interestingly, previous work (Hurwitz et al., 2000) has shown that myomodulin, another modulatory peptide of the feeding network (Cropper et al., 1987b; Miller et al., 1991; Vilim et al., 2000), is also present in the I2-radula protractor system: i.e., both B31/32 and B61/62 and nerve fibers in the I2 muscle are immunoreactive to myomodulin. Here, we show that the same I2 muscle was stained for both ATRP (Fig. 7C1) and myomodulin (Fig. 7C2), and by and large immunopositive processes and varicosities for ATRP and myomodulin overlapped (Fig. 7C3). We also performed a radioimmunoassay to measure the relative amounts of myomodulins and ATRP in the I2 muscle (n = 5). We found that I2 muscles contained 19 ± 2 pmol of myomodulins and 1.1 ± 0.06 pmol of ATRP, which were different statistically (paired t test, p < 0.001). The molar ratio of myomodulins and ATRP in the I2 muscles was 17:1. This ratio corresponded to an ∼1:1 molar ratio of the mRNAs that encode these neuropeptides—the myomodulin precursor contains 16 myomodulin copies (Miller et al., 1993)—while the ATRP precursor has only one copy of ATRP. We next explored functional effects of ATRP and myomodulin on the contraction of I2 muscles. Initially, we examined the direct actions of ATRP on I2 muscle contraction that were measured under isotonic conditions. We found that direct applications of ATRP caused tonic contractions of I2 muscles (Fig. 8A). The threshold concentration of ATRP that produced a statistically significant contraction was as low as 10−9 m. Group data showed that tonic I2 muscle contraction caused by ATRP increased in a concentration-dependent manner (F(4,15) = 102.6; p < 0.0001, n = 4). ATRP peripheral actions. A, B, Direct effects of ATRP on I2-protractor muscles. A, ATRP produces a dose-dependent increase in the tonic contraction of the I2 muscle. Bar graph, Group data. B, The tonic contraction of the I2 muscle produced by 10−6 m ATRP is reversed by 10−6 m MMa. 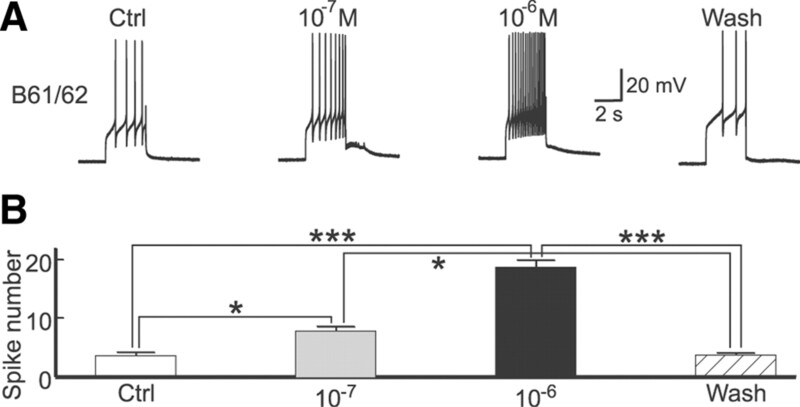 C, ATRP alone produces tonic effects of motoneuron-evoked contractions of the I2 muscle (I2m) in a concentration-dependent manner. C5, Motoneuron-elicited contractions after peptide actions reach a steady state. E1, Group data of the ATRP effects on the amplitude of phasic contraction elicited by B61/62 as shown in C. D, The tonic contractions are largely absent when low concentrations of MMa (10−8 m) are coapplied with ATRP (10−9 m and 10−8 m). Instead, the magnitude of B61/62-evoked phasic muscle contraction increases. D5, The last contractions in D1 (1) and D4 (2) are overlaid (amplitude is normalized to the peak of contraction) to illustrate the faster relaxation rate of the record in D4 that was obtained during application of both ATRP and MMa, compared with the record in D1 that was obtained in control condition. E2, Group data of the ATRP/MMa effects on the amplitude of phasic contraction elicited by B61/62 as shown in D. Bonferroni post hoc tests: *p < 0.05; ***p < 0.001. Error bars indicate SEM. Interestingly, the effects of ATRP on I2 muscles appear to be opposite to those of myomodulin; myomodulin increases the relaxation rate of I2 muscle contraction (Hurwitz et al., 2000), while ATRP causes maintained contraction with little sign of relaxation. Thus, we determined whether myomodulin may counteract tonic contraction induced by ATRP (Fig. 8B) by applying the most abundant form of myomodulin from the myomodulin precursor (Miller et al., 1993), myomodulin A (10−6 m), onto an I2 muscle that had undergone ATRP-elicited tonic contraction (10−6 m ATRP) (n = 4). MMa relaxed the tonically contracted I2 muscle toward the baseline. The data suggest that ATRP and myomodulin have antagonistic actions on I2 muscle. We next examined how ATRP modulates natural muscle contraction elicited by stimulation of protraction motoneurons. We choose to stimulate B61/62 instead of B31/32 for two reasons. First, because B31/32 is a plateau-generating neuron, it is difficult to control the generation of individual spikes. Second, the movement evoked by B61/62, particularly that by B61, is well defined and more amenable to measurement (Hurwitz et al., 2000). Endogenous peptides are released from motoneurons when bursts of action potentials are evoked with a relatively short interburst interval (Vilim et al., 1996b). To minimize endogenous release of ATRP, we therefore evoked short duration bursts of B61/62 with relatively long interburst interval. Specifically, we stimulated B61/62 at ∼18 Hz for 1–2 s every 30 s. This stimulation paradigm evoked brief I2 contractions that were similar in amplitude and quickly returned to baseline after termination of B61/62 stimulation at each trial (Fig. 8C1). When we applied 10−8 m ATRP (Fig. 8C3) there was a slight increase in the amplitude of muscle contraction during stimulation of B61/62. But the more obvious effect was that after B61/62 stimulation the muscle contraction no longer returned to the prior baseline level. Instead, following the onset of peptide application, muscle contraction only partially relaxed after B61/62 stimulation and stayed at a higher baseline level each time B61/62 was stimulated. Similar but more pronounced results were observed when 10−7 m ATRP was applied (Fig. 8C4, n = 4). These data, combined with the data above (Fig. 8A,B), indicate that ATRP produced a tonic contraction through a direct action on the I2 muscle. Note that after the ATRP-induced tonic contraction reached a steady state, B61/62-elicited phasic contraction was not much larger than that in the controls (Fig. 8C5). Indeed, group data showed that although B61/62-elicited phasic contraction increased somewhat with ATRP, the increase was not statistically significant (Fig. 8E1, F(4,12) = 2.38, p > 0.05, n = 4). At present, it is not clear whether ATRP, by acting alone, makes a physiologically relevant contribution to the movements elicited by B61. However, we have shown that ATRP and myomodulin are colocalized in the same protraction motoneurons and, thus, are likely to be coreleased and act jointly on the I2 muscle when protraction motoneurons are active. Therefore, we examined the combined effects of myomodulin and ATRP (Fig. 8D). MMa at 10−8 m somewhat increased B61/62-induced muscle contraction. When we additionally applied 10−9 m ATRP or 10−8 m ATRP, the amplitude of the phasic I2 muscle contraction increased further (Fig. 8E2, F(4,12) = 66.75, p < 0.0001, n = 4). More importantly, the tonic effect of 10−8 m ATRP, as shown Figure 8C3, was absent, likely because of the relaxing actions of MMa (see Fig. 8D5). Overall, although when applied alone ATRP and myomodulin had distinct and in some respects antagonistic effects on I2 muscle contractions, the combined effects of both peptides was to increase the amplitude of motoneuron-elicited phasic contractions. Consistently, when we stimulated B61/62 we did not observe tonic contraction, because ATRP and myomodulin are released together. Given that we observed ATRP-immunoreactive neurons in the CBI-containing regions of the cerebral ganglia as well as in the CBCs, we reasoned that ATRP may modulate the buccal CPG. We first sought to determine whether one of the CBIs contains ATRP. We focused on the ventral surface of the cerebral ganglion (Fig. 4E), where we observed one intensely stained neuron in the “E” cluster in which CBI-4 is located (Rosen et al., 1991). To determine whether this ATRP-positive neuron was in fact CBI-4, we first performed biocytin backfill of the CBC, to which CBI-4 projects its axon. The backfilled neurons, visualized with fluorescein, were mostly ipsilateral to the CBC and included the MCC (Fig. 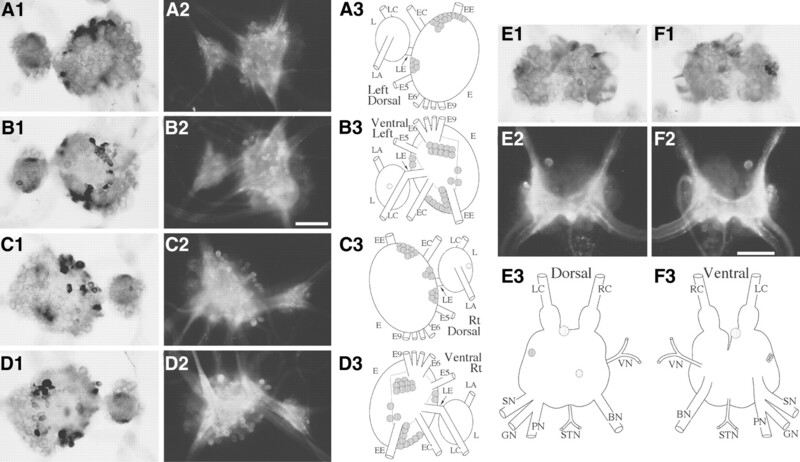 9A1, arrowhead), cells in the E cluster and in the “M” cluster (where CBI-2, CBI-12, and CBI-3 are located) (Fig. 9A1). Immunostaining with ATRP antibody indicated that one CBI located in the E cluster stained for ATRP (Fig. 9A2, A3), while no cells in the M cluster, including CBI-2, were stained. Consistent with Figure 4D, the MCC (arrowhead) was not positive. High-order interneuron CBI-4 is ATRP immunopositive. The right panels are overlaid images of the left and middle panels, where the yellowish color indicates double-labeling. A, Backfill of CBC using biocytin (fluorescein) (A1) indicates that one CBI in the ventral E cluster immunostains for ATRP (Rhodamine Red) (A2). There are no stained cells in the M cluster where CBI-2 is located; neither is MCC (arrowhead) immunopositive. B, CBI-4 (in the E cluster) injected with carboxyfluorescein (B1) is immunopositive with ATRP (B2). In both A and B, the left sides of the ganglia are shown. Scale bar (in B3), 500 μm for A; 100 μm for B. Next, we performed double-labeling experiments. We injected CBI-4 with carboxyfluorescein (Fig. 9B1) and stained with ATRP antibodies (Fig. 9B2); the experiments showed that CBI-4 was double labeled (Fig. 9B3), indicating that CBI-4 is ATRP immunopositive. The finding that CBI-4 contains ATRP is of interest because it is one of the CBIs capable of eliciting feeding motor programs when stimulated directly (Rosen et al., 1991; Hurwitz et al., 1999; Jing et al., 2004; Jing and Weiss, 2005). In particular, two CBIs, CBI-2 and CBI-4, can drive ingestive programs in which activity of the radula-closing motoneuron B8 is predominantly active during retraction. However, earlier work (Jing et al., 2004) showed that other parametric features of ingestive programs elicited by CBI-2 and CBI-4 differ: the protraction duration is shorter and the retraction duration is longer in CBI-4-elicited ingestive programs than in CBI-2-elicited programs. The same study also showed that these distinct features of CBI-2 and CBI-4 programs may have resulted from the two CBIs recruiting different subsets of CPG elements. However, it was unknown whether peptidergic mechanisms might make a contribution. Given the fact that peptidergic neuromodulators can modify the parametric features of CPG output (Furukawa et al., 2001; Jing and Weiss, 2001; Morgan et al., 2002; Sweedler et al., 2002; Jing et al., 2007; Koh and Weiss, 2007; Sasaki et al., 2009; Wu et al., 2010), we hypothesized that differences between the parametric features of CBI-2-elicited and CBI-4-elicited programs may be related to differences in the neuropeptide content of the two CBIs. Specifically, because CBI-4 contains ATRP while CBI-2 does not, we determined whether ATRP perfusion can alter the parametric features of CBI-2-elicited programs so that they become more similar to CBI-4-elicited programs. In these experiments, we stimulated CBI-2 throughout protraction, i.e., until the termination of I2 activity (Jing and Weiss, 2001; Jing et al., 2003; Proekt et al., 2004, 2007; Sasaki et al., 2008; Friedman et al., 2009). Previous work has shown that protraction duration was not affected whether or not CBI-2 was continually stimulated after protraction ended (Wu et al., 2007), because during retraction CBI-2 spike output was presynaptically inhibited (Hurwitz et al., 2005). In control conditions (Fig. 10A), CBI-2 stimulation elicited an ingestive motor program where B8 was most strongly active during retraction but only weakly active during protraction. In addition, the protraction duration was relatively long, whereas the retraction duration was relatively short. When ATRP was applied in ascending concentrations from 10−7 m to 10−6 m, the programs remained ingestive. However, the protraction duration was shorter, whereas the retraction duration was longer. Group data (n = 4) showed that ATRP had a significant effect on both protraction (Fig. 10B1, F(3,9) = 11.22, p < 0.01) and retraction (Fig10B2, F(3,9) = 47.39, p < 0.0001) duration. ATRP central actions. 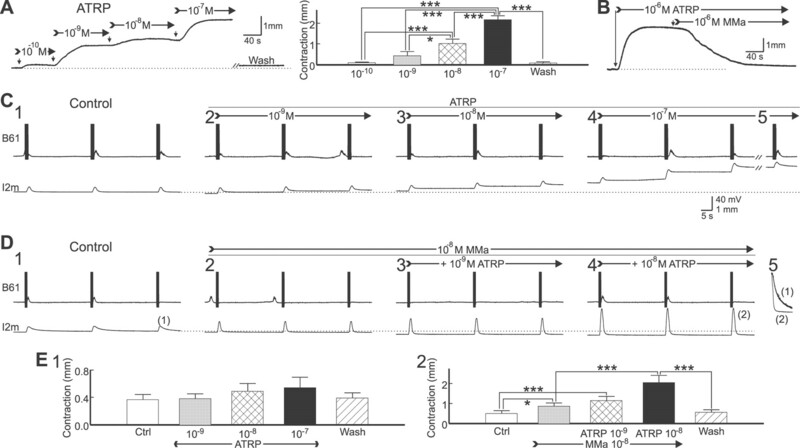 ATRP promotes short protraction and long retraction (A, B) and higher activity of protraction motoneurons (A, C) in CBI-2-elicited motor programs. A, Representative examples. Single cycles of feeding motor programs comprising a protraction–retraction sequence are elicited every 2 min by stimulation of CBI-2. CBI-2 stimulation is terminated after the end of the protraction phase. Protraction phase (open bar) is monitored by activity in the I2 nerve. Retraction (filled bar) is monitored by the sustained depolarization of the B4 neuron and busting activity in B8 after termination of I2 nerve activity. The activity of the radula closing motor neuron B8 occurs predominantly during retraction, suggesting that the motor program is ingestive. Superfusion of ATRP shortens the duration of the protraction phase and prolongs the duration of retraction. Arrow (10−6 m ATRP) indicates transition between the weakening of B8 bursting activity and initiation of a hyper-retraction phase that results in prolongation of the retraction phase. B, Group data for the effects of ATRP on the protraction duration (B1) and retraction duration (B2). C, Group data for effects of ATRP on the activity of protraction motoneurons. Activity of protraction motoneurons B31/32 and B61/62 is represented by the activity of the I2 nerve. The protraction phase is divided into three equal time bins. During the first 1/3 time bins, ATRP increased I2 nerve activity in a concentration-dependent manner. In contrast, during the second 1/3 and last 1/3 time bins, I2 nerve activity was already high in control condition (Ctrl), and ATRP only slightly increased I2 nerve activity. Bonferroni post hoc tests: *p < 0.05; **p < 0.01; ***p < 0.001. Error bars indicate SEM. Previous work (Jing et al., 2004) showed that longer retraction in CBI-4 programs is due to recruitment by CBI-4 of a hyper-retraction phase (Evans and Cropper, 1998), during which B8 fires a high-frequency burst. In our experiments, CBI-2 motor programs lacked this hyper-retraction phase under control conditions and when 10−7 m ATRP was perfused. However, with the perfusion of 10−6 m ATRP, a hyper-retraction phase emerged (Fig. 10A), where there was an abrupt increase in B8 firing (Fig. 10A, compare B8 activity before and after the arrow) and retraction duration was significantly longer. Consistently, in the absence of an abrupt increase in B8 activity at 10−7 m ATRP, retraction duration was not significantly different from that of the control (Fig. 10B2). Because B8 showed a similar firing pattern during hyper-retraction in CBI-4-elicited programs (Jing et al., 2004) and here with ATRP application in CBI-2-elicited programs, it is likely that both CBI-4 and ATRP act through a similar mechanism. Together, through its modulatory actions ATRP may, at least in part, be responsible for the distinct parametric features of CBI-2-elicited versus CBI-4 elicited programs. Shortening of protraction may have functional consequences on peripheral movement. Specifically, because Aplysia muscle contractions are a graded function of motoneuronal firing, the protraction-shortening actions of ATRP reduce the amplitude of protraction movement. We hypothesized that this weakening effect may be offset if ATRP also increases the activity of protraction motoneurons, which would produce larger contraction by releasing an increased amount of the classical transmitter acetylcholine. Moreover, an increase of the firing frequency of protraction motoneurons would result in more peptide (i.e., ATRP and MMa) release because of the frequency dependence of peptide release (Vilim et al., 1996a,b). Coupled with the fact that ATRP and MMa enhance I2 muscle contraction (see previous section), this would act to further increase the amplitude of muscle contraction. To determine whether ATRP indeed promotes the activity of protraction motoneurons, we examined the activity of the I2 nerves (Hurwitz et al., 1994), which contain axons of protraction motoneurons. We did so to determine whether, in CBI-2-elicited motor programs, the activity of protraction motoneurons changed during ATRP perfusion (Fig. 10A). Examination of I2 nerve recordings during CBI-2-elicited motor programs in control conditions suggested that I2 activity was relatively weak in the early part of protraction and strong in the later part of protraction. Thus, to quantify modulation of the motoneuronal firing, we divided protraction into three equal time bins and calculated the spike frequency in each. The group data indicates that during the first of the three time bins, I2 nerve activity increased in a concentration-dependent manner (Fig. 10C1, F(3,9) = 25.86, p < 0.0001), whereas during the middle (Fig. 10C2, F(3,9) = 2.69, p > 0.05) or the last (Fig. 10C3, F(3,9) = 3.62, p > 0.05) of the time bins the increase was not statistically significant, although I2 nerve activity increased somewhat. Next, we determined whether ATRP can directly increase the activity of protraction motoneurons. We elicited the firing of protraction neurons B61/62 in high-divalent saline through 3 s current injection every 30 s. We then perfused 10−7 m ATRP and 10−6 m ATRP (Fig. 11A) and found that ATRP increased B61/62 activity in a concentration-dependent manner (Fig. 11B, F(3,9) = 104.6, p < 0.0001). Note that the current pulses used to test B61/62 excitability were constant throughout the experiment, and the amplitude of the constant current pulses was chosen so that B61/62 fired a small number of spikes during the control period, thus allowing up and down modulations of B61/62 activity by ATRP. Together, ATRP may offset the weakening of protraction movement due to shortening of protraction by increasing B61/62 activity as well as increasing B61/62-elicited I2 muscle contraction. ATRP directly increases B61/62 excitability. A, Representative examples. Three second constant current pulses elicit four or three spikes in B61/62 during control (Ctrl) or wash, respectively, but elicit a larger number of spikes in B61/62 during perfusion of ATRP in a concentration-dependent manner. Recordings were made in high-divalent saline. B, Group data. Bonferroni post hoc tests: *p < 0.05; ***p < 0.001. Error bars indicate SEM. Our goal was to determine whether feedforward compensatory mechanisms act via neuropeptide modulators. Here we use the well defined and accessible feeding network of Aplysia. To allow for novel peptides to be involved, we successfully extended an enhanced RDA procedure to work with individual identified Aplysia neurons. We showed that a peptide, ATRP, identified using RDA, is biologically active in both the periphery and the CNS. More importantly, we confirm ATRP involvement in a feedforward compensatory mechanism mediated by its central and peripheral actions. Similar to most other techniques, RDA has limitations. It generally requires that the expression of the target sequence (mRNA) in the tester neurons be relatively abundant. In this regard, RDA is especially useful for discovery of neuropeptides, as the mRNAs for secretory proteins, such as peptides, are typically abundantly expressed (Strand, 1999). Moreover, subsequent in situ hybridization and immunostaining can localize neurons that express the peptide in limited quantities. Thus, the RDA technique is effective for identifying novel peptides in identified neurons. Allatotropin was originally identified in the insect Manduca sexta, where it functions to stimulate the synthesis of juvenile hormones (Kataoka et al., 1989), which play a role in metamorphosis and reproduction. Subsequently, peptides with similar sequences were identified in other insects, mollusks (i.e., Lymnaea) and annelids (earthworms) (Elekonich and Horodyski, 2003; Weaver and Audsley, 2009) (Fig. 3C). Notably, the two molluscan (Lymnaea and Aplysia) peptides differ only by a single amino acid. 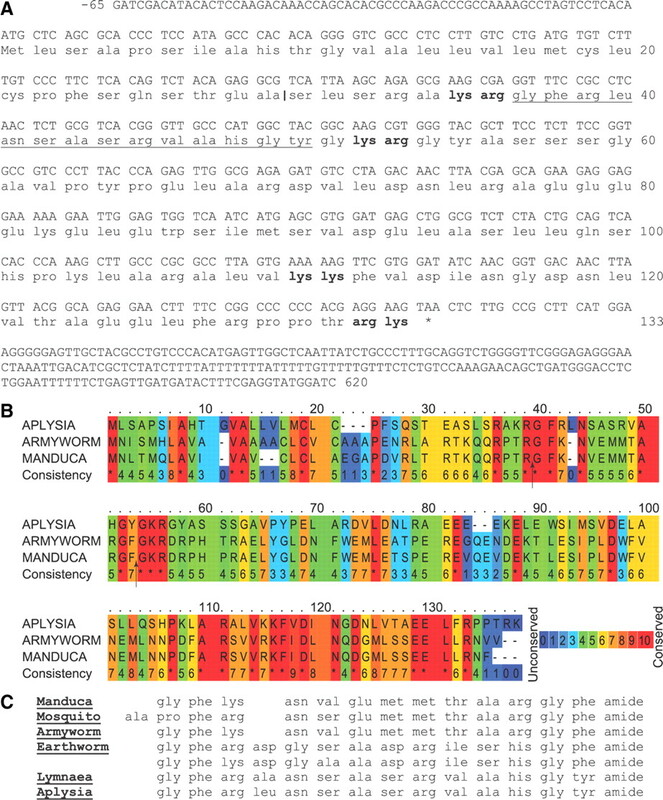 The cDNA encoding allatotropin has been reported in several insects including Manduca (Elekonich and Horodyski, 2003) (Fig. 3B). However, the Lymnaea precursor was not described. Thus, the ATRP precursor in Aplysia represents a first identification in a mollusk. Although originally identified as a stimulant of the synthesis of juvenile hormone, more recent studies suggest that allatotropin is pleiotropic. Most prominently, allatotropin is myoactive in the cardiac system and the gut in several species. In fact, this is how this peptide was identified in the mollusk Lymnaea, which does not contain juvenile hormones (Li et al., 1993). Consistently, ATRP is also myoactive in Aplysia. These observations and additional studies (Audsley and Weaver, 2009) suggest that allatotropin may regulate feeding. However, little information has been available regarding how such a putative function may be implemented by the specific feeding circuitry elements that we now describe in Aplysia. We used the extensive prior identification of many of the critical circuitry elements throughout the Aplysia feeding network (Rosen et al., 1991; Hurwitz et al., 1994; Jing and Weiss, 2001; Morgan et al., 2002; Sasaki et al., 2009) and show that ATRP plays specific modulatory roles in both the periphery and the CNS. In this sense, ATRP joins a long list of neuropeptides in both invertebrates and vertebrates that may be viewed as the gut-brain peptides. However, the central and peripheral actions of these previously identified peptides did not appear to be functionally related, perhaps with the exception of vertebrate CCK, which may promote satiety both centrally and peripherally (Strader and Woods, 2005; Chaudhri et al., 2008). Here we show that central and peripheral actions of ATRP may compensate for one consequence of the central effect of ATRP on motor programs, i.e., protraction shortening. Specifically, in the CNS ATRP is localized in CBI-4 and promotes the parametric features of CBI-4-elicited programs. Interestingly, although a number of CBIs have been shown to contain peptides (Hurwitz et al., 1999; Xin et al., 1999; Morgan et al., 2002; Sweedler et al., 2002), until now CBI-4 was one of few CBIs without any neuropeptides assigned to it. CBI-2 and CBI-4 are two high-order interneurons capable of driving ingestive motor programs (Rosen et al., 1991; Jing and Weiss, 2001; Jing et al., 2004). However, motor programs evoked by the two interneurons differ in that protraction duration is shorter and retraction duration is longer in CBI-4 versus CBI-2 ingestive programs (Jing et al., 2004). We show that ATRP superfusion converts CBI-2-eliticted programs into programs that are CBI-4-like. Thus, ATRP actions may be an important means by which CBI-4 elicits distinct forms of programs that were suggested to be swallowing-like programs (Morton and Chiel, 1993; Jing et al., 2004) in contrast to bite-like programs/behaviors elicited by CBI-2 (Jing and Weiss, 2005). The short protraction and long retraction result, in part, from the ability of CBI-4 to preferentially recruit two CPG neurons, B30 and B51, respectively (Jing et al., 2004). Our observation of B8 hyper-retraction during ATRP superfusion suggests that ATRP likely extends retraction by recruiting B51. Future work will determine whether ATRP, like CBI-4, acts on B30 and B51 so as to promote short protraction and long retraction. Regardless of the specific CPG targets of ATRP, shorter protraction tends to produce weaker protraction movement because the amplitude of Aplysia muscle contraction is a function of the duration of motoneuronal activity. However, ATRP central and peripheral actions function in a feedforward manner to compensate for the potential reduction of protraction amplitude. 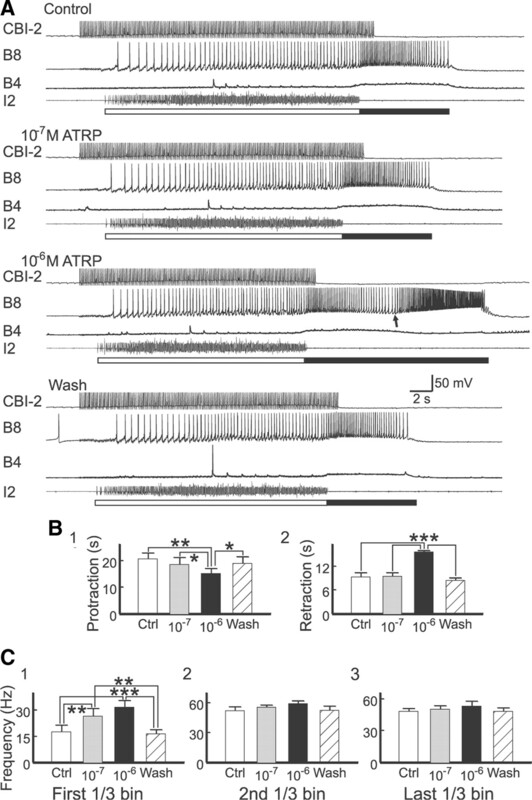 First, in the CNS ATRP directly promotes the excitability of protraction motoneurons (Fig. 11), which likely functions to increase the firing frequency of protraction motoneurons in motor programs (Fig. 10C), thereby increasing muscle contraction amplitude. Second, in the periphery ATRP acts in conjunction with myomodulin to enhance the contraction amplitude of the radula protractor muscles, which are exclusively innervated (Hurwitz et al., 1994) by ATRP/myomodulin-positive B31/32 and B61/62. Moreover, both modulators are present in nerve fibers within the muscle and likely coreleased to the muscles from the B31/32 and B61/62 nerve terminals in the muscles. Intriguingly, combined effects of two peptide cotransmitters (ATRP and myomodulin) may be more physiologically relevant than the isolated effects of either peptide alone. Extensive work in Aplysia has demonstrated various combinatorial actions on the amplitude and relaxation rate of contraction by multiple peptides in motoneurons (Weiss et al., 1993; Brezina and Weiss, 1997). Here, we find that in isolation ATRP causes I2 muscle tonic contraction (which had not been observed in Aplysia) and similarly causes the inability of motoneuron-elicited muscle contraction to relax to baseline after termination of motoneuronal activity. However, this ATRP effect on the relaxation is absent when ATRP and myomodulin are applied together. Instead, we observed only enhanced contraction. Considering the likelihood that ATRP and myomodulin are coreleased, the normal function of the two peptides is to enhance I2 muscle contraction. More generally, the data indicate the importance of identifying peptide complements in single neurons, because combined effects of cotransmitters may not be easily predicted from their isolated effects. In the absence of the ATRP peripheral effects, the ATRP-induced increase in the activity of protraction motoneurons by itself will provide some degree of compensation. Thus, the peripheral actions of ATRP should be additive. Moreover, because peptides are released more with more activity of the peptide-containing neuron (Whim and Lloyd, 1989; Vilim et al., 1996a,b) and peptide actions tend to be persistent (Fox and Lloyd, 2001; Koh and Weiss, 2005; Friedman and Weiss, 2010), it is likely that peripheral actions of ATRP may build up as more programs are elicited, thereby providing stronger compensation during the behavior. There may be additional peptides in ATRP-containing neurons, and these peptides could also contribute to feedforward compensation. 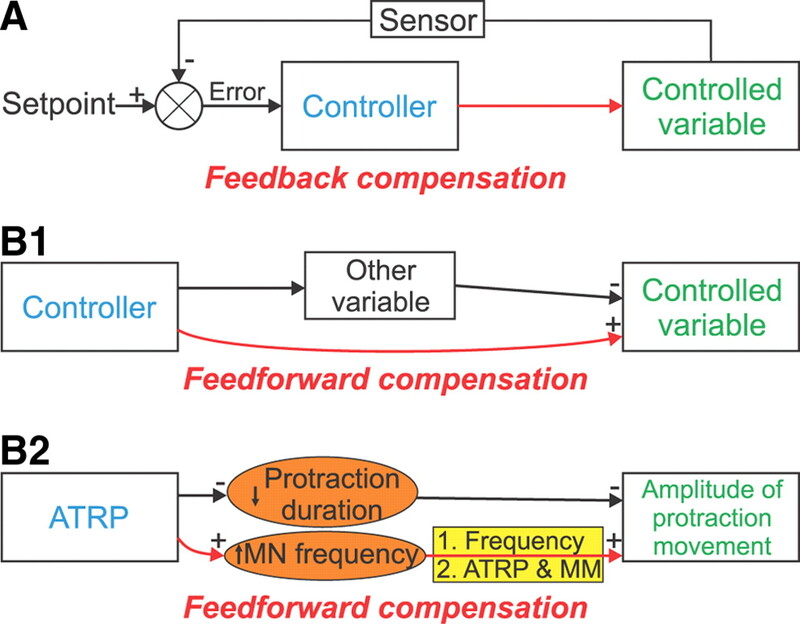 It is instructive to compare how the feedback compensation commonly observed in homeostatic regulation of neuronal and network function (see Introduction) and the feedforward compensation identified here (Fig. 1) may achieve stable output. Perhaps a disadvantage of feedforward compensation is that its compensation appears coarse, that is, it is not as accurate as negative feedback compensation which, given sufficient time, will return the system to a constant/stable output as dictated by a setpoint. However, the design of feedforward compensation is relatively simple because it does not require a setpoint and a mechanism that senses the changes in the controlled variable(s). More interestingly, because the same controller compensates its own effects (Fig. 1B), this type of feedforward compensation will automatically occur, without delay, whenever the compensation is required. In effect, this compensatory mechanism is anticipatory. In Aplysia feeding network, what is compensated is a consequence of the goal to produce a shorter movement, here implemented by the central actions of ATRP. At the same time, other actions of ATRP compensate for this unintended consequence (i.e., weakened protraction). This compensation is functionally important, because without it protraction strength would have been reduced progressively as protraction duration was shortened. In summary, a novel peptide (ATRP) identified using single neuron RDA allows us to demonstrate how central and peripheral actions of a peptide may be functionally related. The findings also suggest the importance of identifying peptide complements in individual neurons to obtain a better understanding of peptidergic modulatory mechanisms. Finally, our data are consistent with the notion that regulation of juvenile hormone synthesis by insect ATRP may be a secondary function that evolved later (Elekonich and Horodyski, 2003), whereas one original function of ATRP is to regulate feeding. More generally, because so many other peptides act both centrally and peripherally, it is likely that the organizational principle described herein, i.e., feedforward compensation, may be used by other invertebrate or vertebrate peptides. This work was supported by National Institutes of Health Grants RO1 DA 13330, NS 066587, NS 031609, and MH051393 and by National Institute on Drug Abuse Award P30 DA 018310 to the University of Illinois at Urbana-Champaign Neuroproteomics Center. We thank J. Randall for performing initial neuromuscular experiments. (2009) Neuropeptides associated with the regulation of feeding in insects. Gen Comp Endocrinol 162:93–104. (1997) Analyzing the functional consequences of transmitter complexity. Trends Neurosci 20:538–543. (2008) Gastrointestinal satiety signals. Annu Rev Physiol 70:239–255. (2008) An intrinsic feed-forward mechanism for vertebrate gaze stabilization. Curr Biol 18:R241–R243. (1987a) Multiple neuropeptides in cholinergic motor neurons of Aplysia: evidence for modulation intrinsic to the motor circuit. Proc Natl Acad Sci U S A 84:3486–3490. (1987b) Myomodulin: a bioactive neuropeptide present in an identified cholinergic buccal motor neuron of Aplysia. Proc Natl Acad Sci U S A 84:5483–5486. (2003) Insect allatotropins belong to a family of structurally-related myoactive peptides present in several invertebrate phyla. Peptides 24:1623–1632. (1998) Proprioceptive input to feeding motor programs in Aplysia. J Neurosci 18:8016–8031. (2001) Evidence that post-tetanic potentiation is mediated by neuropeptide release in Aplysia. J Neurophysiol 86:2845–2855. (2010) Repetition priming of motoneuronal activity in a small motor network: intercellular and intracellular signaling. J Neurosci 30:8906–8919. (2009) Motor outputs in a multi-tasking network: Relative contributions of inputs and experience-dependent states. J Neurophysiol 102:3711–3727. (1999) The Aplysia mytilus inhibitory peptide-related peptides: identification, cloning, processing, distribution, and action. J Neurosci 19:9618–9634. (2001) The enterins: a novel family of neuropeptides isolated from the enteric nervous system and CNS of Aplysia. J Neurosci 21:8247–8261. (2003) PRQFVamide, a novel pentapeptide identified from the CNS and gut of Aplysia. J Neurophysiol 89:3114–3127. (1999) Feedforward versus feedback control in children and adults subjected to a postural disturbance. Exp Brain Res 125:153–162. (1994) Identifying differences in mRNA expression by representational difference analysis of cDNA. Nucleic Acids Res 22:5640–5648. (1994) Compartmentalization of pattern-initiation and motor functions in the B31 and B32 neurons of the buccal ganglia of Aplysia californica. J Neurophysiol 71:1514–1527. (1999) C-PR neuron of Aplysia has differential effects on “Feeding” cerebral interneurons, including myomodulin-positive CBI-12. J Neurophysiol 81:521–534. (2000) Serotonergic and peptidergic modulation of the buccal mass protractor muscle (I2) in Aplysia. J Neurophysiol 84:2810–2820. (2005) Transforming tonic firing into a rhythmic output in the Aplysia feeding system: presynaptic inhibition of a command-like neuron by a CPG element. J Neurophysiol 93:829–842. (2005) Two-color in situ hybridization in the CNS of Aplysia californica. J Neurosci Methods 149:15–25. (2001) Neural mechanisms of motor program switching in Aplysia. J Neurosci 21:7349–7362. (2005) Generation of variants of a motor act in a modular and hierarchical motor network. Curr Biol 15:1712–1721. (2003) Concerted GABAergic actions of Aplysia feeding interneurons in motor program specification. J Neurosci 23:5283–5294. (2004) The construction of movement with behavior-specific and behavior-independent modules. J Neurosci 24:6315–6325. (2008) Neural analog of arousal: persistent conditional activation of a feeding modulator by serotonergic initiators of locomotion. J Neurosci 28:12349–12361. (2009) Evolving concepts of arousal: insights from simple model systems. Rev Neurosci 20:405–427. (1989) Identification of an allatotropin from adult Manduca sexta. Science 243:1481–1483. (2005) Peptidergic contribution to posttetanic potentiation at a central synapse of Aplysia. J Neurophysiol 94:1281–1286. (2007) Activity-dependent peptidergic modulation of the plateau-generating neuron B64 in the feeding network of Aplysia. J Neurophysiol 97:1862–1867. (1993) Purification and characterization of a novel tetradecapeptide that modulates oesophagus motility in Lymnaea stagnalis. Biochem Biophys Res Commun 197:1056–1061. (2001) Cerebrin prohormone processing, distribution and action in Aplysia californica. J Neurochem 77:1569–1580. (1993) Cloning the differences between two complex genomes. Science 259:946–951. (2002) Forward models in visuomotor control. J Neurophysiol 88:942–953. (1991) Localization of myomodulin-like immunoreactivity in the central nervous system and peripheral tissues of Aplysia californica. J Comp Neurol 314:627–644. (1993) The myomodulin-related neuropeptides: characterization of a gene encoding a family of peptide cotransmitters in Aplysia. J Neurosci 13:3358–3367. (2004) Neuronal microcircuits: frequency-dependent flow of inhibition. Curr Biol 14:R837–R839. (2002) Interneuronal and peptidergic control of motor pattern switching in Aplysia. J Neurophysiol 87:49–61. (1993) In vivo buccal nerve activity that distinguishes ingestion from rejection can be used to predict behavioral transitions in Aplysia. J Comp Physiol A 172:17–32. (2004) Dynamical basis of intentions and expectations in a simple neuronal network. Proc Natl Acad Sci U S A 101:9447–9452. (2005) Identification of a new neuropeptide precursor reveals a novel source of extrinsic modulation in the feeding system of Aplysia. J Neurosci 25:9637–9648. (2007) Multiple contributions of an input-representing neuron to the dynamics of the Aplysia feeding network. J Neurophysiol 97:3046–3056. (1991) Identification and characterization of cerebral-to-buccal interneurons implicated in the control of motor programs associated with feeding in Aplysia. J Neurosci 11:3630–3655. (2005) IEEE conference on decision and control and European control conference A cricket-inspired neural network for feedforward compensation and multisensory integration, pp 227–232. (2008) An input-representing interneuron regulates spike timing and thereby phase switching in a motor network. J Neurosci 28:1916–1928. (2009) Distinct inhibitory neurons exert temporally specific control over activity of a motoneuron receiving concurrent excitation and inhibition. J Neurosci 29:11732–11744. (1999) Expression and branch-specific export of mRNA are regulated by synapse formation and interaction with specific postsynaptic targets. J Neurosci 19:6338–6347. (1988) A simple subtractive hybridization technique employing photoactivatable biotin and phenol extraction. Nucleic Acids Res 16:10937. (2005) Gastrointestinal hormones and food intake. Gastroenterology 128:175–191. (1999) Neuropeptides: regulators of physiological processes (MIT, Cambridge). (2002) Identification and characterization of the feeding circuit-activating peptides, a novel neuropeptide family of Aplysia. J Neurosci 22:7797–7808. (1989) A subpopulation of cerebral B cluster neurons of Aplysia californica is involved in defensive head withdrawal but not appetitive head movements. J Exp Biol 147:1–20. (1994) Structure, localization, and action of buccalin B: a bioactive peptide from Aplysia. Peptides 15:959–969. (1996a) Costorage and corelease of modulatory peptide cotransmitters with partially antagonistic actions on the accessory radula closer muscle of Aplysia californica. J Neurosci 16:8092–8104. (1996b) Release of peptide cotransmitters in Aplysia: regulation and functional implications. J Neurosci 16:8105–8114. (2000) Peptide cotransmitter release from motorneuron B16 in Aplysia californica: costorage, corelease, and functional implications. J Neurosci 20:2036–2042. (2001) Cloning, expression and processing of the CP2 neuropeptide precursor of Aplysia. Peptides 22:2027–2038. (2010) Distinct mechanisms produce functionally complementary actions of neuropeptides that are structurally related but derived from different precursors. J Neurosci 30:131–147. (2009) Neuropeptide regulators of juvenile hormone synthesis: structures, functions, distribution, and unanswered questions. Ann N Y Acad Sci 1163:316–329. (1993) Physiology and biochemistry of peptidergic cotransmission in Aplysia. J Physiol Paris 87:141–151. (1989) Frequency-dependent release of peptide cotransmitters from identified cholinergic motor neurons in Aplysia. Proc Natl Acad Sci U S A 86:9034–9038. (2007) State dependence of spike timing and neuronal function in a motor pattern generating network. J Neurosci 27:10818–10831. (2010) Composite modulatory feedforward loop contributes to the establishment of a network state. J Neurophysiol 103:2174–2184. (1999) Actions of a pair of identified cerebral-buccal interneurons (CBI-8/9) in Aplysia that contain the peptide myomodulin. J Neurophysiol 81:507–520.